WASHINGTON — With two new satellites in orbit and a third on the way, APT Satellite of Hong Kong continues to grow, but company executives remain worried about Asia-Pacific market conditions. APT Satellite on March 19 reported 1.24 billion Hong Kong dollars ($160 million) in 2018 revenue, up 2.5 percent from the year prior. Pre-tax earnings were flat at 619.6 million Hong Kong dollars. Last year, two of APT Satellite’s new satellites launched: Apstar-6C on a Chinese Long March 3B/E rocket in May, and Apstar-5C, a Telesat-owned spacecraft that APT Satellite helped finance and design, in September on a SpaceX Falcon 9. Both replace older spacecraft while adding new features — Ka-band capacity on Apstar-6C and high-throughput Ku-band capacity on Apstar-5C. But the Asia-Pacific remains, as APT Satellite has described it for years, one defined by “fierce” competition. In its annual financial report, APT Satellite described 2018 market conditions as bleak, with no sign of reprieve coming in 2019. APT Satellite wrote that for 2018, transponder market conditions regionally and globally were in a state of continuous decline. APT Satellite is not alone in describing the satellite communications market in the Asia Pacific as acutely challenging. Regional competitors AsiaSat of Hong Kong and Thaicom in Thailand similarly reported pricing pressure impacting their 2018 financial results. 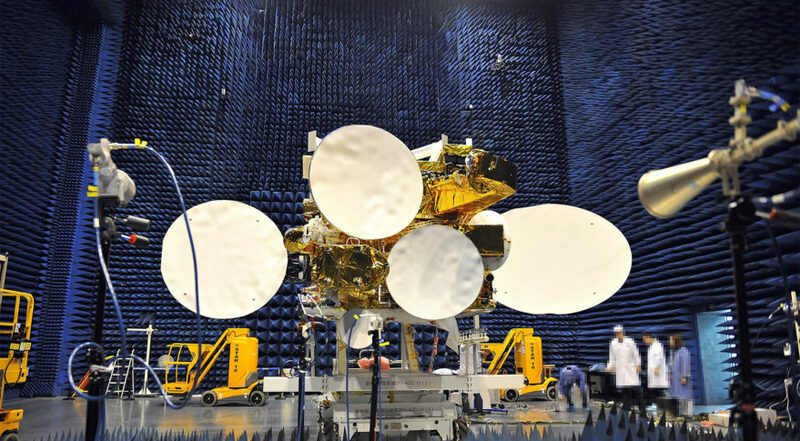 “Looking into 2019, the global and Asia-Pacific Region satellite transponder market is continuing under the condition of oversupply and fierce competition,” APT Satellite wrote. APT Satellite operates four primary satellites (Apstar-5C, -6C, -7 and -9) in geostationary orbits, plus two older satellites (Apstar-5 and -6) in inclined orbits that save fuel but limit the types of communications services they can provide. APT Satellite said it filed an insurance claim for Apstar-6, which suffered a solar array problem in May that reduced the spacecraft’s power, and that the claim procedures are nearly completed. The 14-year-old satellite was built by Thales Alenia Space. Apstar-6D, the operator’s next satellite, is scheduled “to be delivered on ground at the end of 2019,” the company said. APT Satellite did not provide a launch date for Apstar-6D. China Great Wall Industry Corp., manufacturer of Apstar-6D, said in November that the satellite remained on track for a 2019 launch on a Long March 3B. In contrast to APT Satellite’s recent launches, which replaced older satellites, Apstar-6D is a growth satellite intended to bring new high-throughput capacity to mainland China and the broader Asia Pacific. APT Satellite is participating in the Apstar-6D project through a joint venture called APT Mobile Satcom Limited, which is headquartered in mainland China.